Paula Aquilla loves the practice of Occupational Therapy and Osteopathy! She is a graduate of the University of Toronto and has practiced in a variety of clinical, home and community settings since 1986. Paula is also an osteopathic manual practitioner and specializes in paediatrics. She is the director of Aquilla Occupational Therapy; a family oriented practice that is full of fun and learning! Paula was the founder and was the director of Yes I Can! Nursery School, Yes I Can! Summer camps and the I Love My Baby programs in Toronto from 1990-1996. She was the founding director of Giant Steps, Toronto. Paula currently consults to the Muki Baum Treatment Centres in Toronto and she consults to many school in Toronto. She teaches throughout Canada, the United States, Australia, the UK, and India. Her practice encompasses all types of children and young adults and her specialty is sensory integration therapy. Paula has been a guest lecturer for the University of Toronto, McMaster University and Humber College. She is published in the field: she is a co-author of Building Bridges through Sensory Integration: Occupational Therapy for Children with Autism and other Developmental Disorders (1998) and is a contributor to Children, Youth and Adults with Asperger’s Syndrome. Paula has contributed to other magazines and special interest newsletters in Canada, the US and the UK. She is the technical editor for the SI Focus Magazine. Paula brings warmth and enthusiasm in her work with children and their families. Aquilla Occupational Therapy Services was established in 1990. Ellen Yack M.Ed., B.Sc.OT, OT Reg.(Ont.) is an occupational therapist who possesses a unique combination of expertise in the areas of clinical work, consultation, education and public speaking. Ellen has practiced as an occupational therapist since 1979 and has a Masters Degree in Education. She is internationally recognized for her expertise in sensory processing and autism spectrum disorders. Ellen's other areas of expertise include developmental coordination disorder, global developmental delay, attention deficit disorders and learning disabilities. 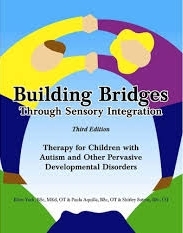 She is one of the co-authors of Building Bridges Through Sensory Integration: Occupational Therapy for Children with Pervasive Developmental Disorders which won a Teachers Choice Award for Best Special Education Classroom Resource. Ellen is also a contributor to the book Children, Youth and Adults with Asperger Syndrome. Shirley Sutton (BSc, OT Reg(Ont)) is a private occupational therapist helping children and youth with long and short term developmental disabilities, and adults with developmental disabilities.